This article is about the 2007 pop album. For the popular song, see Into White. Into White is an album by the American singer-songwriter Carly Simon. It is her 23rd studio album (30th overall), and her fifth album of pop standards. 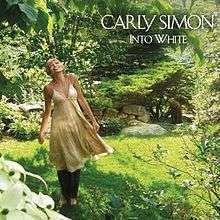 Released on January 2, 2007 by Columbia Records, Into White was produced by the Martha's Vineyard producer Jimmy Parr, with whom Simon has worked extensively as his studio is close to her Tisbury farm. Simon's children, Sally Taylor and Ben Taylor, appear on the album. The three perform a choral trio on the track "You Can Close Your Eyes". After the success of Reflections and Moonlight Serenade, Into White continued Simon's recently rejuvenated high chart profile and became Billboard′s Hot Shot Debut, entering the chart at No. 15 and peaking at No. 13 in its second week, and staying on the charts for 10 weeks. The album also hit No. 1 on the Top Internet Albums chart. The album received a very warm and positive reception from critics. PopMatters rated 8 out of 10, and called the album "the first musical gift to grace 2007", and praised the track "You Can Close Your Eyes" saying "There’s a shimmering beauty that’s particular to how familial voices intertwine and the union of these three voices is singularly beautiful", and concluded "Ultimately, Into White serves the legacy of Carly Simon very well". People Magazine awarded the album 3 out of 4 stars, calling it "a tranquil collection of covers that play like lullabies for grown-ups" and praised the track "You Can Close Your Eyes" calling it "The best moment on the album". Entertainment Weekly rated the album B, and called it a "richly personal disc". AllMusic rated the album 3 out of 5 stars, and concluded the review with "In sum, Into White may be the best record Simon's made since The Bedroom Tapes". The New York Times stated "Entering the world of Carly Simon’s new album is like tiptoeing into an enchanted garden. The fanciful Cat Stevens song that opens the record establishes a mood of deep, dreamy calm that is sustained over 14 songs". Amazon.com stated "Simon, vocally sure-footed as ever, wicks the warmth out of every last track and directs it with pinpoint precision to her listeners--nobody does music as comfort food better". In her 2008 book Girls Like Us: Carole King, Joni Mitchell, Carly Simon-And the Journey of a Generation, author Sheila Weller describes this version of "You Can Close Your Eyes" as "slow, spectral" and "achingly beautiful." A special copy of the album was released by Barnes & Noble with a bonus track, "Hush Little Baby/My Bonnie". ↑ "Into White press release". PR Newswire. Retrieved 2014-08-10. ↑ "Carly Simon - Chart history | Billboard". Billboard.com. Retrieved 2014-07-17. ↑ Arnold, Chuck (January 15, 2007). "Album Review". People Magazine. Retrieved August 10, 2014. ↑ Holden, Stephen (January 1, 2007). "Album Review". The New York Times. Retrieved August 10, 2014. ↑ "Amazon.com - Into White". Web.archive.org. Archived from the original on October 23, 2007. Retrieved 2014-08-10. ↑ Weller, S. (2008). Girls Like Us: Carole King, Joni Mitchell, Carly Simon--And the Journey of a Generation. Simon & Schuster. ISBN 9781416564775. ↑ "Into White [Barnes & Noble Exclusive]". Barnes&Noble.com. Retrieved 2014-08-10.